When floor space is tight and applications call for the product to be moved up or down, Dorner’s trio of SmartFlex curve conveyors are the perfect answer. The SmartFlex Helical Curve, Spiral, and Alpine conveyors greatly expand the capabilities of Dorner’s SmartFlex line by giving customers the ability to move product up or down and around equipment to accommodate tight spaces. Dorner’s SmartFlex line is a flexible conveyor platform that reduces costs, saves time and offers simple configuration and acquisition options to Dorner’s customers within the packaging, medical, health and beauty, industrial automation and electronic industries. The SmartFlex Helical Curve allows incline or decline movement through corners and straights and provides the capability for vertical incline with minimal space. The SmartFlex Spiral is capable of twisting 360° degree turns to move product vertically with an extremely small footprint. 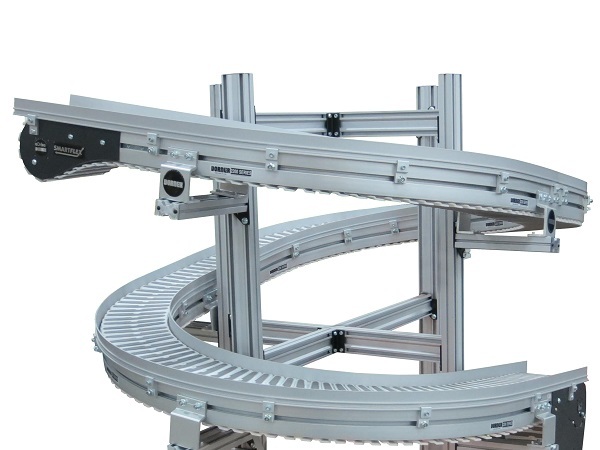 Both the helical and spiral conveyors feature a patent pending chain design that allows the conveyor to maintain speeds and loads through the angled curve. The SmartFlex Alpine is designed for long, continuous incline or decline runs with tight turns. It’s also ideal for accumulating, buffering and cooling product between processes or machines.